How to Convert PDF to ePub Format Easily and Quickly? If you have an eBook reading device that is only compatible with ePub file format, while you have many PDF eBooks you want to read on this eReader, what will you do? Even if your eReader supports both the ePub and PDF file formats, you must find that when adjusting the PDF to the display, the font is very small. You need to zoom in and out of the PDF files in order to read the content clearly. To better enhance the PDF reading experience, you should convert PDF to ePub format. Why choose to convert PDF to ePub? You know ePub format is fully compatible with almost all eBook Reading devices, such as iPad, iPhone, iPod, Sony Reader, Kobo, Nook and so on. ePub can adjust to the display automatically and you can read the content clearly without having to zoom in and out. Then, how to convert PDF to ePub for getting a better reading experience with your eBook reader? 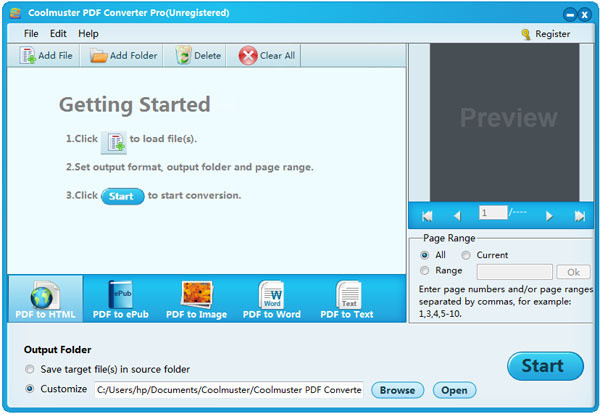 You can depend on Coolmuster PDF Converter Pro to help you achieve the conversion goal. It is a professional PDF conversion program which is able to convert PDF to ePub format quickly while keeping the original file quality. What you see the layout and formatting in the source PDF files are the same as what you get in the converted ePub eBooks. Just within s steps, you will get through the whole conversion task. 1. Install and launch the PDF to ePub Converter on your PC. Click the Add Files or Add Folder button to import the target PDF files. 2. Preview and choose to convert all the PDF files or just specific PDF pages/ranges to ePub. 3. Specify an output folder to save the converted ePub files and click Convert to kick off the conversion. That is all about how to save PDF as ePub format with Coolmuster PDF Converter Pro. After the conversion, you can check the converted ePub eBooks in the output folder and send them to your eBook reader for reading. In addition to convert PDF files to ePub, you can also use PDF Converter Pro to convert PDF to other popular file formats, such as Word, Text, Images, HTML, etc. 200 PDF files can be converted at one time and after the conversion, you can edit and share your PDF files without any restriction. With Coolmuster PDF Converter Pro, eBook reading life will be full of variety.